Spin has launched in D.C. with 100 scooters, and will increase its District fleet by about 50 scooters per week. WASHINGTON — San Francisco-based dockless electric scooter company Spin, which entered D.C.’s dockless pilot this year with bikes but decided to pivot to electric scooters, has begun deploying its scooter fleet in D.C. It also has opinions about new dockless rules that will take effect in 2019 in the District. Spin was acquired earlier this month by Ford. Spin has launched in D.C. with 100 scooters, and will increase its District fleet by about 50 scooters per week. It said that by the end of December, it will have a fleet of 400 scooters in D.C., in all eight wards, near transit hubs, shopping areas and office parks. Like its scooter rival Bird, Spin does not think a new rule capping scooter speeds at 10 mph is a good idea. “We think that a 10 mph speed limit is the wrong way to address the District’s safety concerns about electric scooters, and may actually deter usage of an electric vehicle designed to quickly take people to their first zero and last mile,” Spin said in a statement to WTOP. “While we are set up to comply, we hope the city reconsiders this piece of regulation so they don’t unintentionally limit usage of an environmentally friendly transportation lifeline,” Spin said. 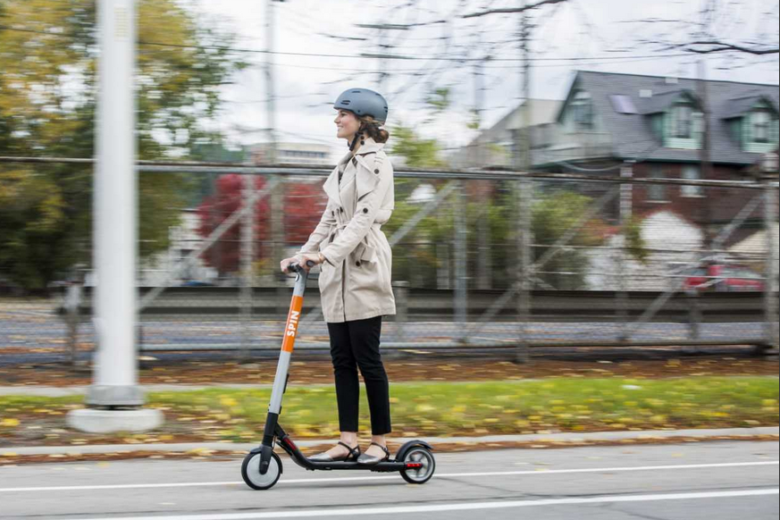 Unlike Bird, which opposes a cap on the number of scooters in any one company’s fleet to 600, Spin is OK with that regulation. “We have no problems in having operators capped at 600 vehicles in D.C. while the city understands demand and usage in service areas,” the statement said. Bird argues capping fleet size will make it hard to be profitable, and will encourage scooter companies to station their scooters in only high-use areas, not underserved neighborhoods. Spin scooters are currently in nine cities and five college campuses across the country. The company said its users have taken more than one million rides to date. Spin joins Bird, Skip, Lime and Lyft in operating electric scooters in D.C. Jump operates a fleet of dockless bicycles.